Want to be able to easily make pretty décor, personalized gifts, and fun cards for upcoming holidays? 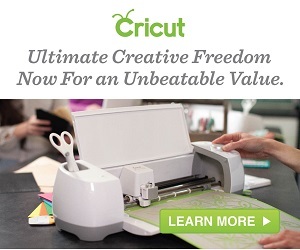 Then you need to treat yourself to a Cricut Explore Air™ — Cricut's very popular electronic cutting machine. It's the best DIY crafting tool to be developed since the sewing machine! The Cricut Explore Air is versatile, easy to use, and allows for very precise cuts. It's also incredibly affordable, especially since Cricut generously discounted the cost by up to $200 on the machine and bundles — just in time for the holiday crafting season! Go to Cricut.com and check out the savings Cricut is offering on their Cricut Explore Air™ and bundles today so you can get your very own in time to make this holiday season your most creative one yet! To kick-off the season of thanksgiving, gratitude, and giving, Blurb is offering all new customers $5 off their Blurb orders of $20 or more now through November 30th! Just use the code GIVE5 at checkout to receive your savings. This makes it even easier for you to create that special photo book — just in time for the holiday season! Terms & Conditions: Offer valid from November 2 to November 30 2015 (11:59 p.m. local time). Valid for printed books only. Get $5 off (USD), $5 off (CAD), $5 off (AUD), 5€ off (EUR), £5 off (GBP) your product total with a minimum order of USD $20, CAD $20, AUD $20, EUR 20€ or GBP £20. This offer is good for one-time use, and cannot be combined with volume discounts, other promotional codes, gift cards, or used for adjustments on previous orders. Offer valid for 30 days after user's FIRST REGISTRATION. Amazing Deals on Christmas Cards! Last year our family created a Christmas card to send out to let our friends and family know that we were thinking about them, we love receiving Christmas cards and hang them up around the house to show our Christmas spirit. We hope that you are able to check out Magnet street and create your own Christmas cards.